At The Stingray Allstars Michigan we are extremely proud of the program that we have developed over the last 10 seasons. Since 2008, we have witnessed change within the Allstar Industry and experienced tremendous growth . No matter the size of the program this place still feels like “home” to so many of our staff, athletes, and their families. Our focus has and will always be, the personal and skill progression of each athlete. Our incredible staff is known for reinforcing safety and technique and this has lead to over 470 National Championships. We are proud of our “One of a Kind” program and gRAYtful to have the opportunity to touch the lives of the many talented athletes in Michigan. Our 12,000 square foot facility is filled with top of the line equipment for your athlete. We offer 2 full Spring Floors, a 7 panel non spring floor, a 40 foot rod floor, an airtrak and a 42 foot tumble track. Stop by for a tour today!! ensure proper technique, build confidence and lends to quicker progression. Progression-Each athlete must fully master a level before moving to the next level. skills DO erode and setbacks can occur. Bring your squad in for a customized camp that is 100% tailored to your needs. We can work on the routine fundamentals: stunting, tumbling (beginner to advance), choreography, and overall clean up. 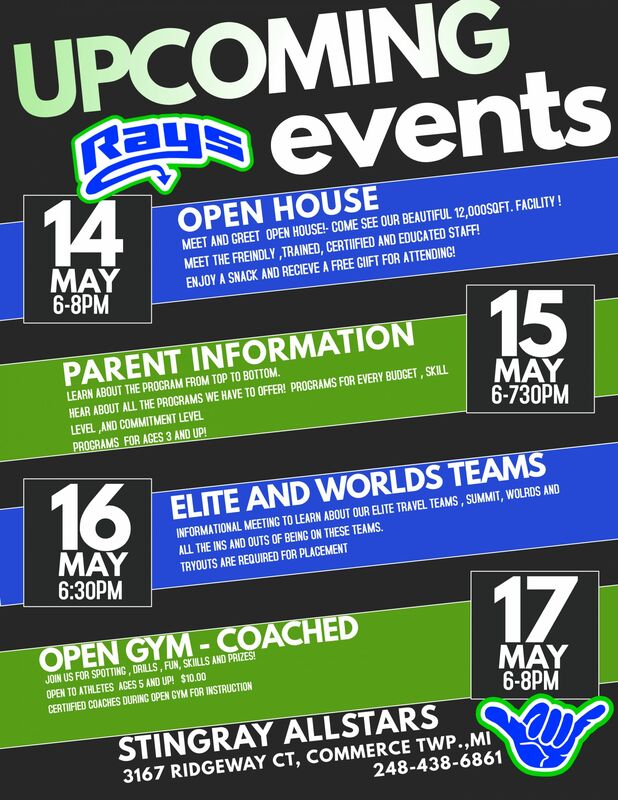 We offer a wide variety of Open Gym times, come tumble with our certified staff! Use this card to come in when the gym is open and work your drills and skills independently. This card CAN NOT be used during open gym, clinics and/or classes. Our punch cards are offered to team and non team members.